When I read Lindy’s post on rhubarb curd, I knew I had to make it. Not only do I have a huge supply of rhubarb, but I also happen to be fond of all things rhubarb, and good rhubarb recipes are not easily found. I will not re-write the recipe, as her explanations are clear and easy to follow and can be found here. It is a delicious variation of lemon curd and can be used easily for any recipe calling for that. I am always happy to find recipes where local ingredients can be used in lieu of imported ones. Not that I have anything against lemons, but I know the lemons we get here are not the same as where they are grown, so why not find a local alternative when possible. I figured this would be a perfect combination for the berries I have been picking lately, and the best way to pair them would be in small, bite-size tarts. Any berries would work, but I used mostly black berries, raspberries and red currants. Blend all the ingredients together until you can form it into a ball. Cover and let rest in the fridge for about an hour. It is difficult to roll this pastry, so just roll each tart separately using an appropriate amount for the size of mould you are using. Once in the tin, weigh it down with some marbles or other weight (like beans or lentils). Bake at 350 F for 15 minutes. Remove the weights and bake for another five minutes. Allow to cool. To make the tarts, fill the centre with some curd and arrange berries on top. They keep well refrigerated for up to three days. Blueberries, now in season, would be perfect too! Categories: baking, dessert | Tags: berries, curd, Fiesta Friday, pastry, rhubarb, tarts | Permalink. You needn’t be a full-time, experienced or savvy forager to take advantage of the wonderful wild food all around us. With simple additions of two or three wild herbs, flowers, seeds or greens, an ordinary dish can be made into something which is visually and nutritionally superior to its standard self. Salads are perhaps the easiest place to get started. The ingredients will vary from week to week, depending on what is growing in your garden, near-by wild areas or even in your flower pots. Just be sure you know what you are picking, and that it is indeed an edible plant. My salad today was inspired by what I found in the garden while out weeding. The base for it is what is growing in the garden at this time of year, namely lettuce and cucumbers (of which I have an alarming amount!) and beet greens, which in this case are actually deep red. Beyond that I noticed a lot of red and blue and decided to work with these as if they were my palette for a salady creation. Even though the colour didn’t fit, I picked some purslane, probably the single most nutritious plant growing in any garden. I have way more this year than any previous year, and am determined to make good use of it while it lasts. For the red theme, I also used the young leaves of red amaranth which has successfully seeded itself each year. 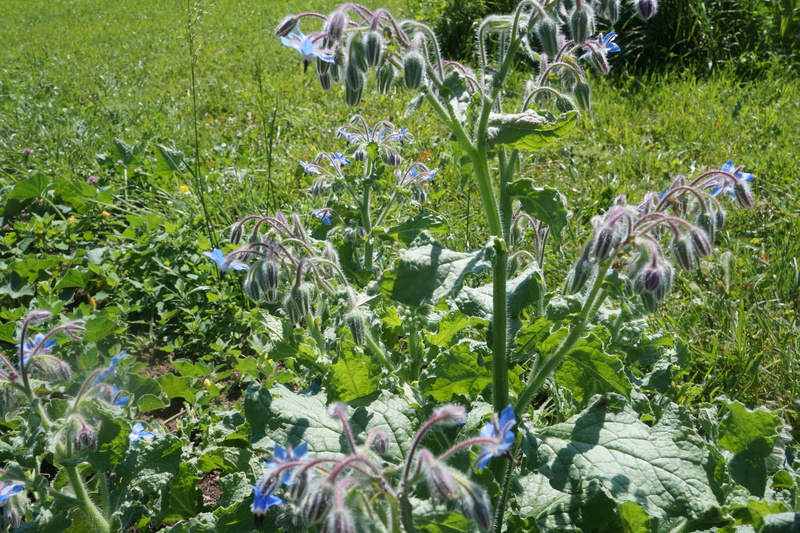 and borage flowers for a lot of sweetness, like honey. and Johnny-Jump-Ups for a mild wintergreen flavour. I considered using the goutweed next to it, but it didn’t fit in with the colour. 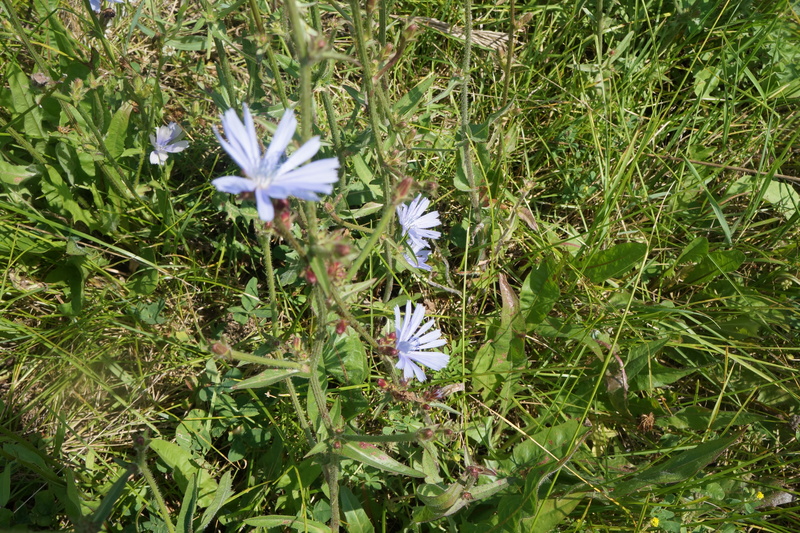 This was not the only plant that had to be excluded because of its colour. A few blackberries and a vinaigrette made by mixing some strained blackberry jam into the vinegar before combining it with oil and seasoning. The final result was a wonderful mixture of sweet, bitter and sour, light and fresh with some robust flavour not always found in summer salads. I will not likely be able to duplicate this exact recipe as one or more of the ingredients will soon no longer be available, but I will continue to experiment with wild ingredients, and hope you will give it a go too. Categories: edible flowers, edible weeds | Tags: amaranth, beet greens, black berries, borage, chicory, Johnny Jump Ups, purslane, salad dressing | Permalink. I am not a fan of commercial soft drinks whatsoever, but once I started making my own from ”bugs’, which are fermented roots (often ginger root) with sugar, I have had great fun making and consuming all sorts of variations of fizzy drinks. Especially after working several hours (or at least what seems like several hours) in the garden, I am rewarded with a tall cool drink of whatever mixture I have fermenting in the kitchen. The process is really very simple, but it does take a little time. I try to make a couple of bottles a day so that I always have some on hand. To begin, I mix a couple of tablespoons of chopped fresh ginger with an equal amount of sugar in about a cup of water in a covered mason jar. Each day I add half that amount of ginger and sugar until the mixture begins to bubble which is around five days, at which point it is ready to make a drink of whatever flavour I want with a second fermentation. The second part is where the interesting flavours come in, although because it is a ginger bug, there will be a good gingery flavour already. For these drinks I used ginger-friendly fruits, rhubarb for one and sumac for the other. You will need flip top bottles for this so that no gas escapes during fermentation. The bottles I used hold two cups so it made measuring easy – 1 3/4 cup sumac or rhubarb juice (descriptions below), 1 tsp sugar (or a little more if you want it sweeter) and 1/4 cup ginger bug. Mix well, bottle and leave to ferment from 2-5 days depending on the temperature of your kitchen and how much sugar you have used. For a first attempt I recommend opening it after two days to see how it’s doing. If there is no ‘pop’ at all when you open it, leave it for another day or two next time, although it will still be very good, just not too bubbly. Because I use little sugar, I like to leave mine for five days to give it a really good fizz, but then I do have to be careful to open it slowly and expect a little to escape. Kind of like opening champagne! If you want it for later, refrigerate it which will slow down any further fermentation – but not stop it all together. For the juices, I cooked some chopped rhubarb covered in water with sugar to taste and strained. For the sumac, I simply used water infused with sumac berries. After you have used the ‘bug’, add water to replace the liquid you have strained out of it, and continue to feed it ginger and sugar daily. Or put it in the fridge and carry on another day. You will have to remove some of the ginger from time time, which I do whenever I am making a soup, dressing or stir-fry into which it goes very nicely. Categories: beverage, edible weeds, foraging | Tags: Fiesta Friday, ginger bug, naturally fermented fruit drinks, rhubarb soda, sumac soda | Permalink. The pollen from cattails or bulrushes (typha angustifolia) is only available for a short period. In previous years I have completely missed it or collected too little for it to be of any use. Even this season I have collected only a small amount, but enough to get an idea of how best to get and use it. 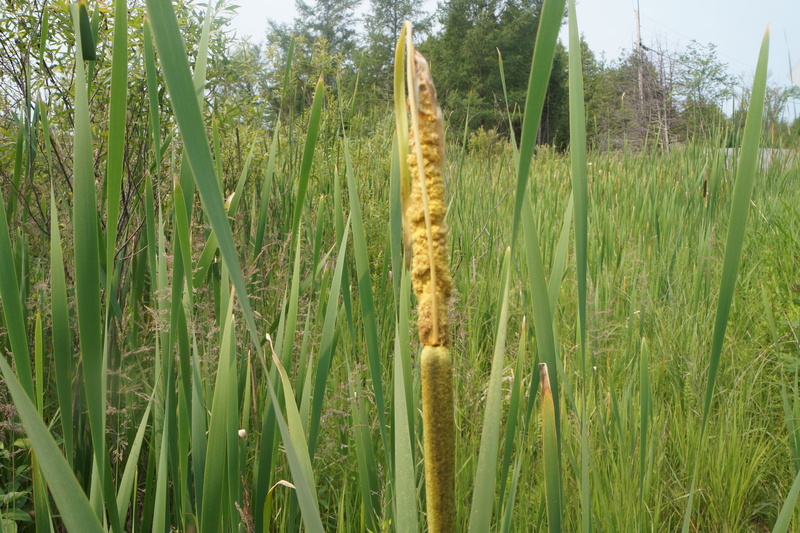 Cattails grow in swampy areas, difficult to access because of the wet and irregular ground. They are ready when the male part of the flower, a tall spike growing above the sausage like female flower, is a golden yellow colour. If they are brown, you are too late. To collect the pollen, hold a plastic bag below the flower, keeping the opening as small as possible so the pollen doesn’t blow away. Bend the plant over into the bag and give the flower a good shake. You will get up to one tablespoon of pollen from each flower. Since this job requires two hands, I was unable to get a picture of the process, but it is pretty easy to figure out. Just make sure there are no holes in your bag. To use the pollen, pass it through a fine sieve to remove any of the bushy bits and bugs. I had to repeat this process a few times to get rid of all the extraneous matter. You will be left with a fine yellow powder which can be used to replace some of the flour in baking bread, biscuits or pancakes, or you can sprinkle it on hot cereal or yogurt. Like bee pollen which can be bought in health stores for a healthy price, it is full of nutrients but much cheaper. If you are lucky and collect enough, it can replace up to 1/3 the quantity of flour. Pancakes seem to be a favourite for this ingredient, so I decided to bake scones, and I’m so glad I did. The colour and delicate fruity flavour go so well with these tea-time treats I am now determined to have another go and collect more. But time is of the essence with cattails, so I hasten to pass on this recipe to any readers willing and able to try it for themselves. Pre-heat the oven to 500 degrees F. Mix the dry ingredients thoroughly. Add the butter and blend well, then stir in the currants. Beat the egg and buttermilk together and add the flour mixture, leaving about 2 Tbsp to be brushed on top of the scones. When the liquid is all absorbed, turn the dough onto a floured surface and knead for about five minutes. Roll out and cut into circles. Place on a lined baking sheet and brush with the reserved milk and egg mixture. Sprinkle the sugar on top. I used sugar coloured with dried forsythia flowers. Reduce the oven temperature to 425 F and bake the scones for 12 minutes until they are golden brown. Any which are not going to be eaten right away, cool and freeze. To serve, reheat in a warm oven (300 F) for about 15 minutes. These are best served English style with clotted cream and fruit preserves, but definitely good enough on their own too. Categories: baking, edible weeds, foraging | Tags: cattail pollen, currants, English scones, foraging for cattails | Permalink.